Newly listed 232 Gulfstream Grady. These boats are very popular for their impressive ride in a smaller package. 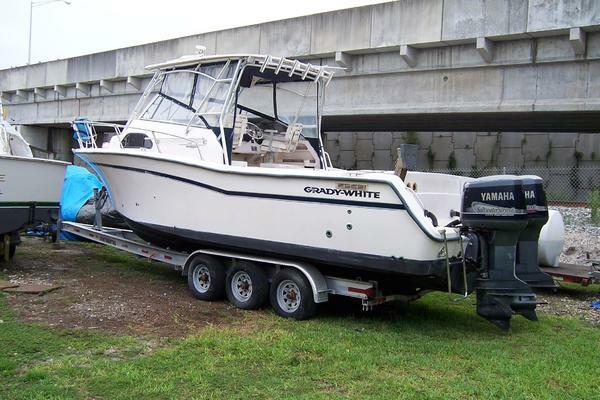 This vessel has a single 225 Yamaha F225STXRA 4 stroke with 786 hours. All service records are available with this boat. Boat is in very good condition and shows very well. Enclosure, live wells, porti potty in the cuddy. Lawrence Elite 7HDL fish finder plus chart plotter and new Yamaha digital gauges. Very nice lift kept boat. There is no trailer but could track one down if you need one. Upholstery is all in very good condition, boat is regularly waxed and serviced. She's ready to go! West Florida Yachts would love to guide you through a personal showing of this 23' Grady-White 232 Gulfstream 2001. This yacht for sale is located in Fort Myers, Florida and priced at $31,000. For a showing please contact us by filling out the form on this page and we will get back to you shortly! Furuno radar is not working and will be sold as is.